“The finest Greek text ever printed” is indeed high praise for any book. It is a book contained in the Van Kampen Collection and behind it is a fascinating story that merits telling. The book, also called the Editio Regia, was printed by Robert Stephanus in 1550 in Paris. However, some historical background is necessary to realize the importance of this book. The Stephanus family (Stephanus is the Latinized version of the French name Estienne) was famous for its printing. The patriarch, Henri, was the royal printer to the King of France. In 1509 he printed a five fold version of the Psalms called the Quincuplex Psalter. It contained five versions of the Psalms in Latin including the Vulgate, the Gallic version, Old Latin and two others. The significance of this book was that it was edited by Faber Stapulensus or LeFevre and is considered by some to be the first book printed in support of the Reformation in France. At that time the movement for reform in France was called Evangelicalism. This movement received support from no less a person than Margaret of Navarre, the sister of King Frances I. So from the very beginning of this movement, the Stephanus family was involved. Over the course of years, Robert succeeded his father as Royal Printer. In 1528 he printed his first version of the Vulgate that was considered to be the most accurate ever published. He soon acquired a reputation not only for the quality of printing but for the accuracy of the text itself. It appears that he expertly combined the roles of both printer and textual critic. Prior to this time the Greek New Testament had been printed primarily by Johannes Froben of Basle. A total of five editions had been printed, all edited by Erasmus, the final edition appearing in 1535. Erasmus died the following year and his work was carried on by others. The person who primarily assumed his role was Robert Stephanus. 1546 saw the printing of Stephanus’ first Greek New Testament. It was a small duodecimal edition that became known as the O Mirificam edition from the preface to the work. A second edition, nearly the same as the first, came out in 1549. At this time the textual study of the Greek New Testament was still in its infancy. The first edition of Erasmus’ Greek New Testament had been printed just thirty years previously in 1516. In the subsequent editions, Erasmus made use of the Greek text of the Complutensian New Testament for better readings. Also during that time, additional Greek manuscripts were recovered and their readings were incorporated into the two editions printed by Stephanus. In 1550 Stephanus printed his third edition of the Greek New Testament. He changed the size of the book to a folio and used a type face that was cut by Claude Garamond, a punch-cutter and type founder in his own right. However, the distinguishing feature of this third New Testament was the alternate readings to the text that Stephanus put in the inner margins of the pages. In reality this was the first printing of a critical Greek New Testament. Thus the reader had access to the other readings or variants for the text itself. As we noted above, this edition was known as the Editio Regia and has been considered by many to be the most beautiful Greek text ever printed. However, the true value was not in its beauty but in the variant readings included in the margins. However, what was considered it greatest value was also the cause of great consequences. When the Sorbonne, the theology faculty of the University of Paris, examined the book and noted the textual variants, they immediately charged Stephanus with heresy and sought to arraign him before the Inquisition. Perhaps you may wonder why a series of textual variants could cause such a reaction from those whose task it was to study the Sacred Scriptures. All of this must be put into the context of what was taking place in France at that time. Evangelicalism as a movement has pretty well spent its force. It was the attempt to reconcile the teachings of the church with a reformation of moral conduct. The more far sighted persons had seen that this would prove to be impossible. Some like William Farel and John Calvin had left the country and the Inquisition claimed the lives of others. The Sorbonne was conservative in its character and portrayed any change or innovation as an attempt to put the church in danger. Thus what was intended to give a more accurate text of the Scripture was considered as an attempt to undercut the authority of the Church. The Scripture of the Church was the Latin Vulgate, and even though the Editio Regia was a Greek New Testament, the doctors of the Sorbonne were fearful if any change would be permitted, it might undercut the authority of the Vulgate. Stephanus made the decision to leave France and join the French exiles in Geneva. This was the home of John Calvin and later Theodore Beza who would continue Stephanus’ work on the Greek text. Indeed, Stephanus would print one more edition of the Greek New Testament. It would be printed in 1551 at Geneva and would be the first printed edition of the New Testament Scriptures that would contain verse divisions. But what about the Editio Regia itself? We have mentioned that it was the first printed Greek text that contained textual variants but there is more. Several of the variant readings contain the letter B . For a number of years scholars were mystified by this reference. However, a manuscript of the New Testament that has come to be known as the Codex Bezae was later located. It is named in honor of Theodore Beza who later would assist John Calvin in the Geneva Academy and continue the work of Stephanus. Eventually Beza would donate the manuscript to Cambridge University. These textual variants come from that manuscript and are the first references to it. How Stephanus in Paris knew of the manuscript as early as 1550 and how those textual variants were communicated to him and from whom, are questions that are still being debated nearly four hundred and fifty years later. There is another significant fact about the Editio Regia. It basically established the text type for the printed Greek New Testament for more than three hundred years. 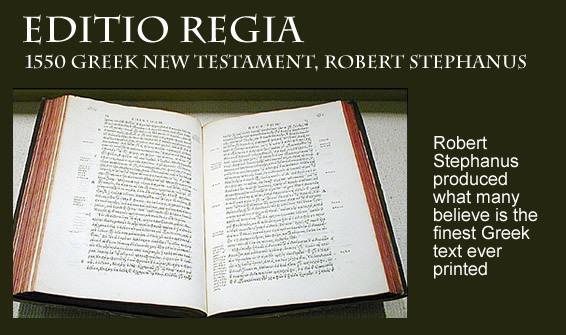 Thus many people are convinced that the Editio Regia is really what came to be known as the Textus Receptus (Received Text) although that term would not be used in print until 1633 with the second edition of the Greek New Testament by the Elzevirs in Leiden. All of the major Bibles printed until the King James Version in 1611 were translated from this text type which is also known as the Byzantine. The Textus Receptus would continue to be the dominant Greek text until 1881 with the printing of the critical Greek Testament edited by B. F. Wescott and F. A. J. Hort. The Critical Greek text would eventually replace the Textus Receptus as the Greek text favored for scholarly research.